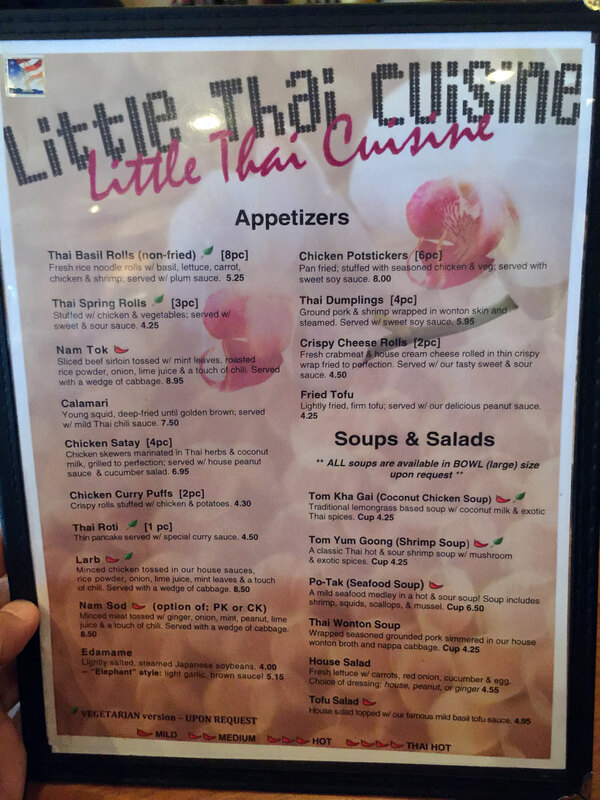 You can find Little Thai Cuisine at 220 Sandy Springs Circle NE, Atlanta, GA 30328, to the West of the intersection of Johnson's Ferry Rd and Mt Vernon Hwy. Both roads interest near Roswell Rd so you can make turns heading West from either to access Sandy Springs Circle, which runs across both. The restaurant is in the "elbow" of the shopping center which is in the middle between the two roads. 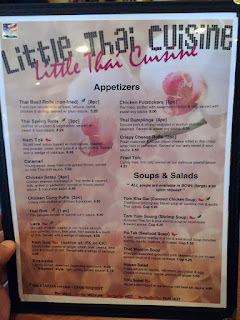 Little Thai is a cozy place with a warm atmosphere and some exterior seating via patio. 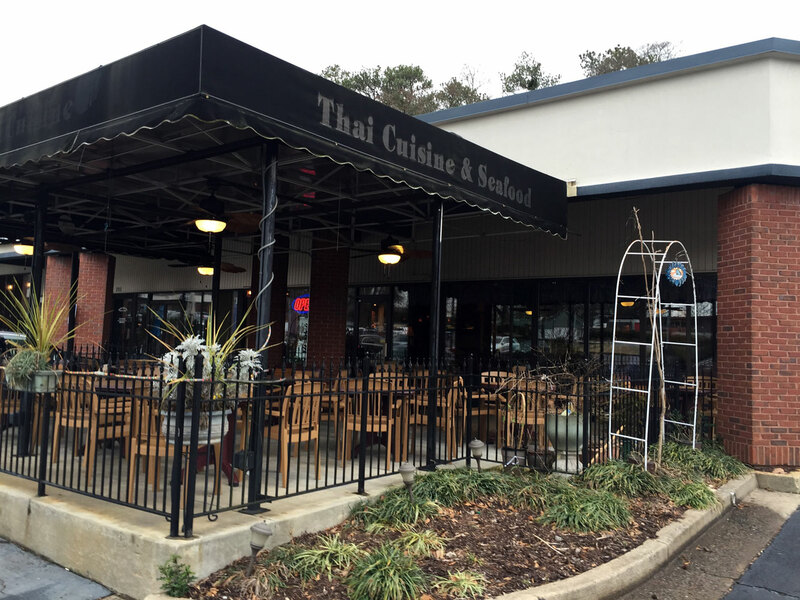 The black awning has "Thai Cuisine & Seafood" prominently in silver/gray - parking is in the lot that extends to the road via several rows. 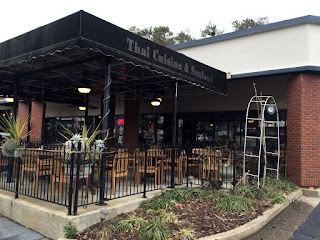 The interior features woody accents typical of Thai restaurants and neat wooden tables with with dried veggies inserted into compartments beneath glass (I've seen similar tables at Top Spice, a Thai restaurant on N. Druid Hills). 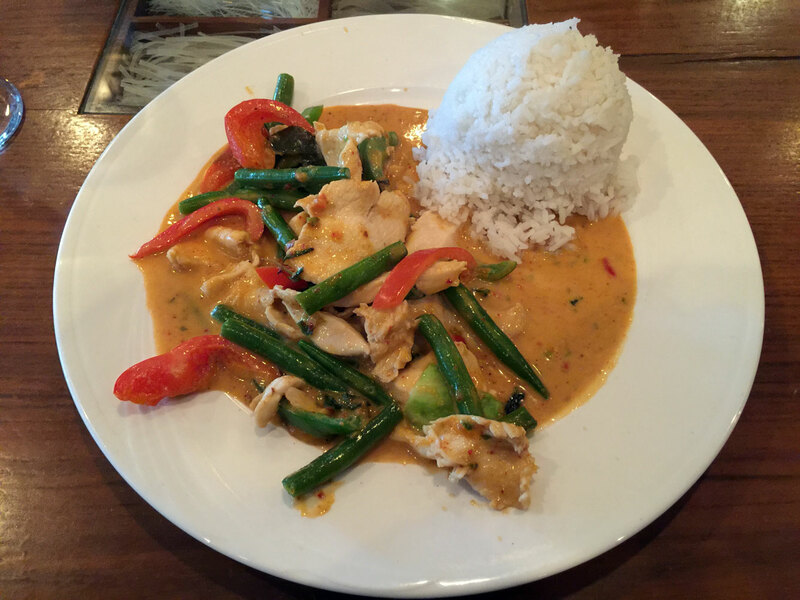 The service here is really good and the people we spoke with were very personable with their recommendations. 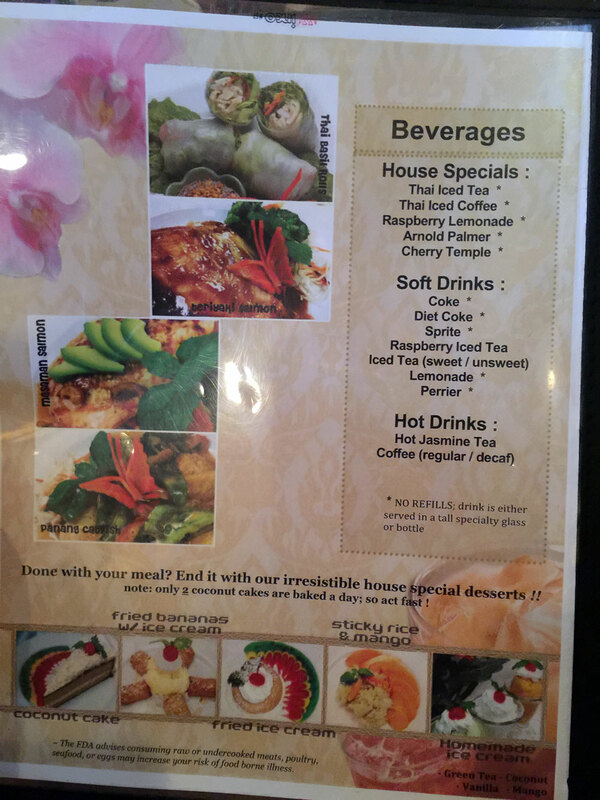 The menu is fairly comprehensive with many of the items you would expect for a Thai restaurant. There are little peppers and leaves indicating whether something was hot or could be vegetarian - I liked the visual cues and it helped as we had one vegetarian with us on this visit. 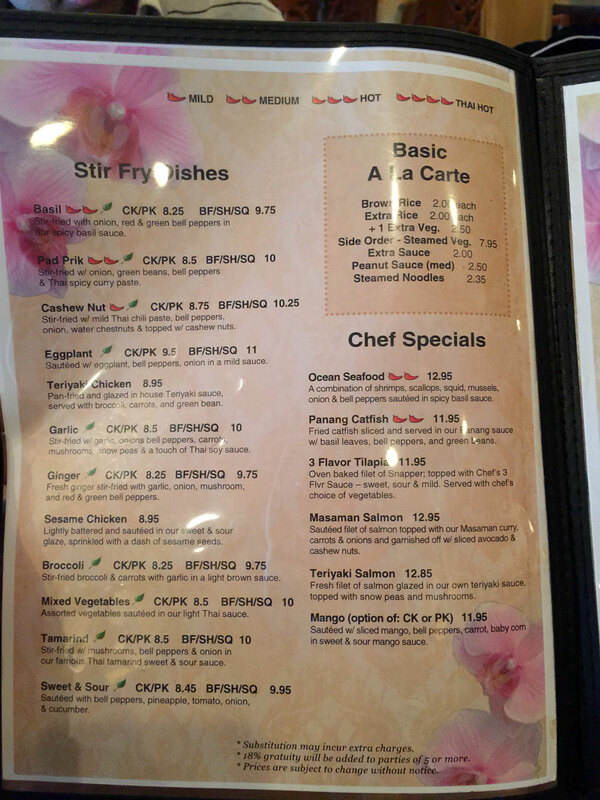 The menu is printed in color with a soft tan patterned background and three-dimensional orchid flowers - quite nice actually and a change from the typical humdrum you normally see - kudos to the restaurant for that. 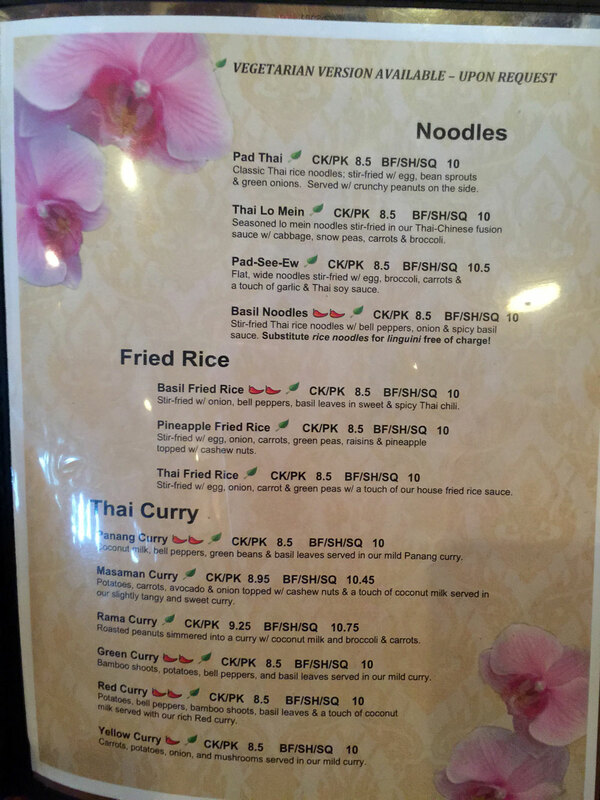 Prices seem to be about average for Thai in this area and perhaps just a little higher than those you'd find at Thai Norcross. 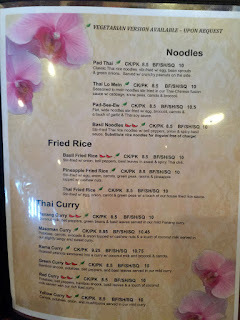 We all decided to try the various curries (two, including the vegetarian are Indian so curry - natch!) and we all decided to get things extra spicy. In general all the ingredients were very fresh - the curries seem to all of us a bit light in application, lacking a depth that we would normally find in more traditional Thai restaurants - I'm assuming that things are dumbed-down a bit here for the American palate. 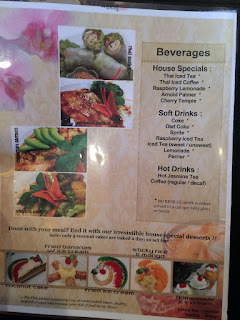 I asked for mine "Thai hot" which usually gets me sweating a bit - none of that here. 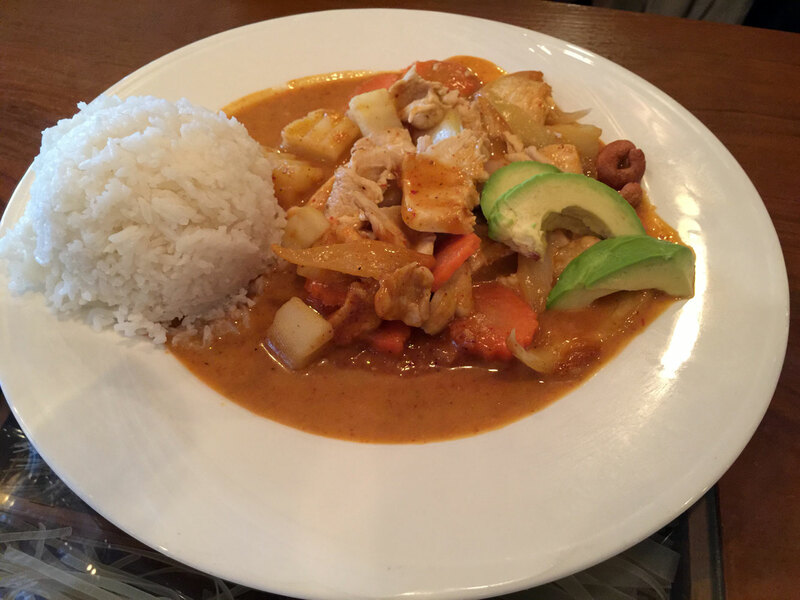 If you look at my photos you'll see what I mean - the curry hardly sticks to the food - it's more of a puddle underneath the ingredients. Not that the food is bad, it's just a bit "weak" so to speak, from what we expected. 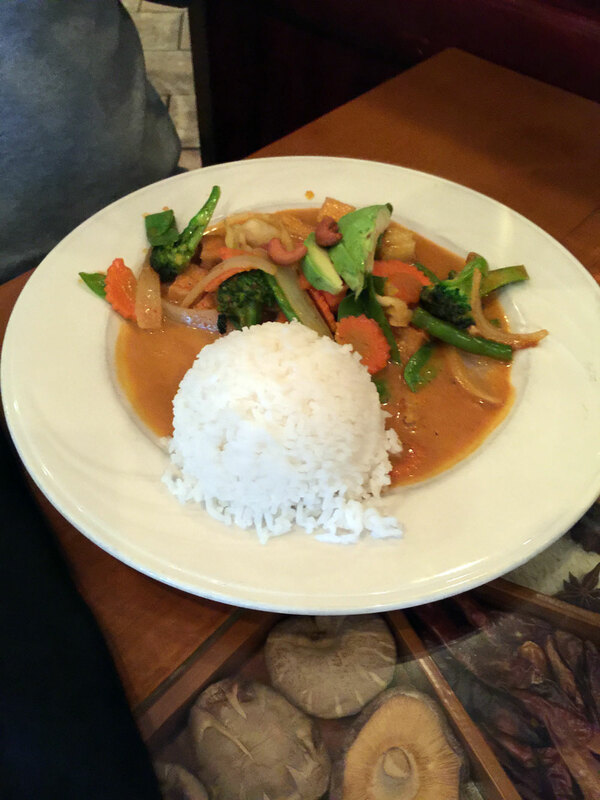 Portions seem average to light, once again compared to Thai Norcross where the oval plate is covered/mounded for a little less in price. So how does this all add up? 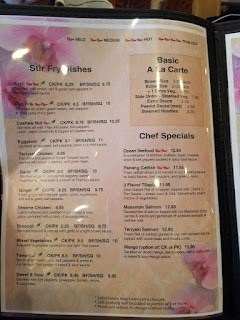 Restaurant was very clean, the service was good, the food simply OK. It prevents me from providing a higher rating that what I think of as acceptable - 3/5 stars. Will I visit again? Sure, this is a very convenient restaurant and near my work. Is there better in the area? 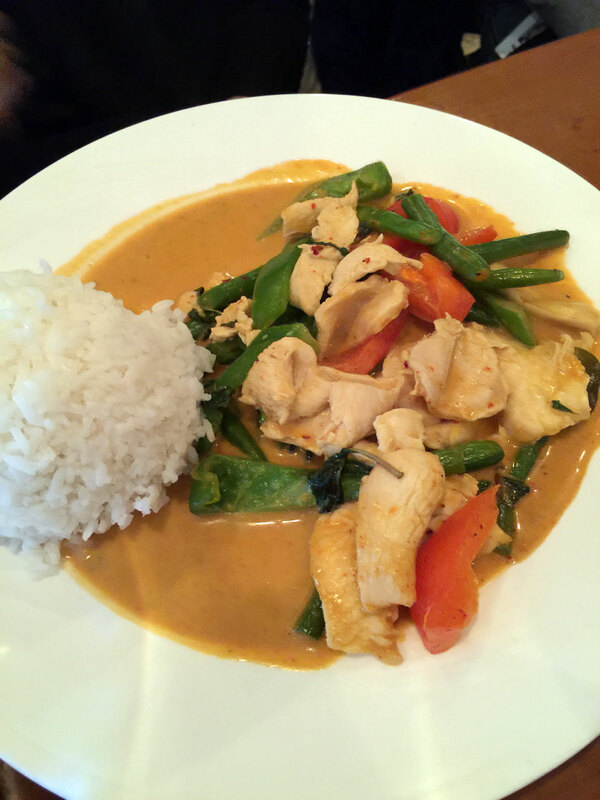 Actually, yes there's Erawan Organic Thai about a mile away. Advice to the owners? 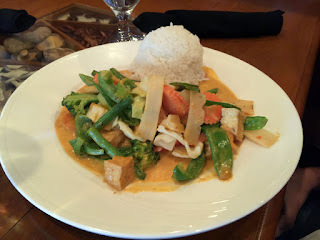 Bring up some of the fantastic, sophisticated flavors that Thai food is known for and only dummy-down the flavors for those requesting "mild" - otherwise you have everything else right!